Members of the United States Intelligence Community will soon begin sharing top-secret information with the White House transition team of president-elect Donald Trump. According to a report by CBS News, Trump’s team will receive “practically the same briefings” as those given by intelligence personnel to US President Barack Obama. The briefings will be delivered by career intelligence officers who are reportedly ready to brief Trump’s transition team as soon as the latter requests it. The 70-year-old business tycoon was confirmed as the president-elect in the early hours of Wednesday, after scoring one of the greatest electoral upsets in American political history. He is scheduled to meet President Obama at the White House this week, where he will discuss with him the pending transition of his executive team, as well as pressing matters of national security. According to CBS, the President has already authorized the Intelligence Community to brief Trump and his senior aides on certain topics. Obama will continue to authorize intelligence briefings given to the Trump team until January 20 of next year, when the Republican president-elect will replace President Obama at the White House. As soon as Trump’s transition team members provide the names of his chosen cabinet officials, the Intelligence Community will begin to brief them as well. Meanwhile US Air Force four-star General Michael Hayden (ret.) raised doubts on Wednesday about Trump’s ability to understand the way intelligence works. General Hayden, who led the National Security Agency and the Central Intelligence Agency in under the Bill Clinton and George W. Bush administrations, told CBS that Trump won Tuesday’s presidential election by “showing anger [and] being accusatory”. These are qualities that are “very alien to the way intelligence works” and do not fit “into the intelligence picture”, he said. General Hayden was one of 50 senior Republican national-security officials who signed an open letter in August, claiming that Trump “lacks the character, values and experience” to be president and “would put at risk [America’s] national security and well-being”. The 50 included former directors of the CIA, the NSA, the Office of National Intelligence, the Department of Homeland Security, and others. Computer hackers believed to be connected to the Russian government were able to access emails belonging to the president of the United States, according to American officials briefed about the ensuing investigation. The cyberattack on the White House was announced by American government officials in October of last year, soon after it was discovered by security experts. But The New York Times said on Saturday that the hacking was far more intrusive than had been publicly acknowledged and that the information breach resulting from it was “worrisome”. The paper said that the individuals behind the cyberattack were “presumed to be linked to the Russian government, if not working for it”. It also quoted one unnamed senior US official, who said that the group that perpetrated the hacking was “one of the most sophisticated actors we’ve seen”. Little concrete information has emerged on the hacking, but it appears to have started with attempts to compromise computers at the US Department of State. As CNN reported earlier this month, the hackers essentially managed to take control of the State Department’s declassified computer network and exploit it for several months. In most American government departments, senior officials operate at least two computers in their offices. One is connected to the government’s secure network used for classified communications; the other is used to communicate unclassified information to the outside world. In theory, those two systems are supposed to be separate. However, it is common knowledge that the publicly linked computers often contain sensitive or even classified information. It is this unclassified part of the network that the alleged Russian hackers were able to access, in both the State Department and the White House. According to The Times, by gaining access to the email accounts of senior US government officials, the hackers were able to read unclassified emails sent or received by, among others, President Barack Obama. The US president’s own unclassified account does not appear to have been breached, said the paper, nor were the hackers able to access the highly classified server that carries the president’s mobile telephone traffic. Nevertheless, the operation to remove monitoring files placed in US government servers by the hackers continues to this day, and some believe that the presence of the intruders has yet to be fully eradicated from the system. The Times contacted the US National Security Council about the issue, but was told by its spokeswoman, Bernadette Meehan, that the Council would “decline to comment”. The White House also declined to provide further information on the incident and the ensuing investigation. Yesterday in a radio interview I opined that I would not be surprised if the White House stepped in to mediate the ongoing dispute between the Central Intelligence Agency (CIA) and the Senate Select Committee on Intelligence. Today, President Barack Obama broke his silence “with respect to the issues that are going back and forth between the Senate committee and the CIA”, as he said. But he refused to take sides —or did he? On Wednesday afternoon, the President responded to a question on the matter by a White House pool correspondent. The question related to the increasingly heated public spat between the CIA and the Senate Intelligence Committee. The latter is tasked, along with its sister body in the House of Representatives, with exercising legislative oversight of the Intelligence Community. Many members of the Committee, which is currently investigating the CIA’s use of enhanced interrogation against terrorism detainees, believe that, not only was the CIA’s use of harsh interrogation methods illegal, but that it also failed to generate useful intelligence. The CIA, however, denies this, and has been quite possessive of documents relating to the issue, which the Committee believes has a right to access. The Agency has now asked the Federal Bureau of Investigation (FBI) to look into whether Congressional staffers illegally removed classified documents from the CIA’s archives that were beyond the scope of the Committee’s investigation. The Committee has in turn asked the Bureau to investigate whether the CIA illegally searched the computers used by staffers to carry out their research into CIA files. The deluge of reports that are flooding the news media about the national security nominations of United States President Barack Obama is both natural and understandable. The Departments of State and Defense, as well as the Central Intelligence Agency, are among the critical components of the American government, especially in matters of foreign policy. Yet much of the commentary on the nominations of John Kerry for State, Chuck Hagel for the Pentagon, and John Brennan for the CIA, is unduly over-dramatizing what is essentially a routine story. 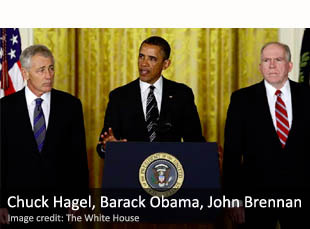 To begin with, it is clear that, in selecting Kerry, Hagel and Brennan for the nominations, the President’s priority was to surround himself with people he knows and trusts. Knowledgeable observers point out that all three nominees come from Obama’s most trusted circle of friends and —if appointed— will allow the President to stay well “within his comfort zone” as he begins his second term in office. In this sense, Obama selected the three candidates, not with some major policy shift in mind, but in order to ensure continuity and permanence in his foreign policy. Take John Brennan, for instance: an Arabic-speaking career officer in the CIA, who has served the Agency in various positions for over 25 years. It is undeniable that, since 2008, Brennan has been instrumental in shaping the thinking behind the Obama administration’s targeted killings program using unmanned drones. According to some analysts, he has been the White House’s “most important adviser for shaping the campaign of drone strikes”. 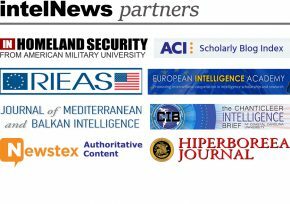 As intelNews explained recently, Washington’s unmanned drone program will continue and most likely expand, but this has little to do with Brennan. As an excellent analysis of Brennan’s nomination (by the Council on Foreign Relations’ Micah Zenko) points out, the CIA’s targeted killing program “has become institutionalized” with a momentum of its own, which ensures its sustainability, “making it far bigger than any one person —even John Brennan”.